This last couple of weeks has been absolutely crazy! I told you that I would be teaching, right. Well, that went well. My lessons went better than expected. The kids seemed to really enjoy them and, aside from one person commenting that they thought it was creepy that I was always listening at their table, the students seemed to like me. The creepy thing really bothered me. Here's the thing. One, I was going around to EVERY table and seeing how the students were doing. Two, I did focus on a certain table because the student I was doing my case study on sat there. I dunno. That bothered me a little, so I thought I'd blow some steam off here. Considering that was almost a month ago and I'm still offended by it, it must have hit a nerve. Anyway..... I really did have a lot of fun teaching. And, like I said, I did a pretty good job. I sounded nervous, but I think that was because of my peers, who were present. After teaching, things really went into hyper drive. Suddenly there was all kinds of analyses to do on our teaching, a big old portfolio, and wrapping up everything else. Holy cow. But, I made it through. We enjoyed a lovely Thanksgiving. Hanging with the family is always a lot of fun. 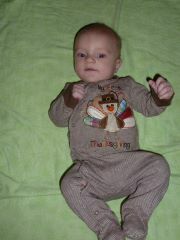 Charlie looked cute in his little first Thanksgiving Onesie. All was well. I do tend to get a little depressed when I am idle. So I've really been trying to clean and stay busy. 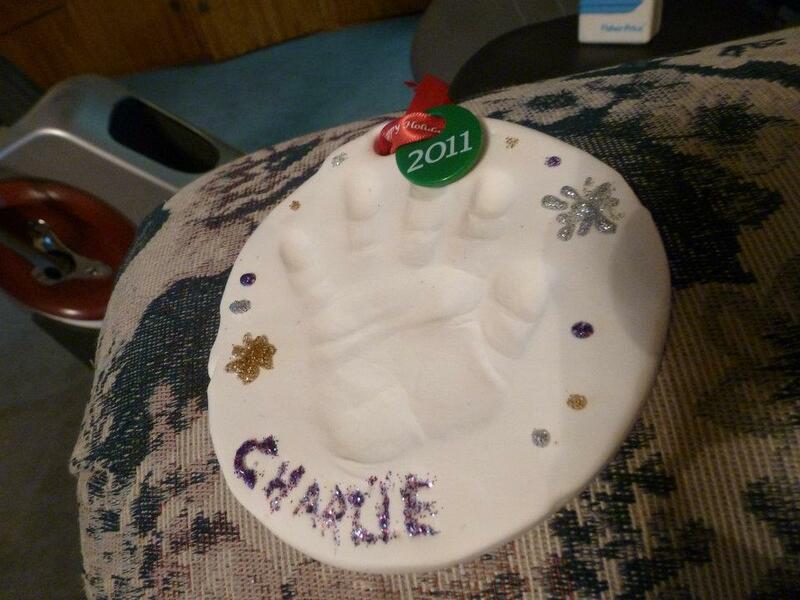 I can't wait for Charlie's first Christmas. We got him a Lion King Blankie. I have to tie it together I guess, but that should be easy enough, I've done one of those before. I also adopted a wolf in Charlie's name. He probably won't care, but he'll get a little wolf stuffed animal out of it. Other than that, ok, this kid is spoiled. He gets a Christmas onesie or jammies every time we go to the store. Gram got him this HUGE baby Einstein bouncer for Christmas. Of course, he's already been in it. He's a little small physically and developmentally, but he has fun for a little bit. There's a rattle on it that he can work, he's sat there for an hour just pushing that thing back and forth. And yelling at it. Man, this kid can YELL. Not a mad yell, just letting the world know he can 'talk.' It's cute.... unless it's in the middle of the night. :D I love that Charlie. In fact, Jay's dad said we should make a blog of webpage up for him. I think I'll do just that. I don't think I'll give him a facebook page. That's kind of silly in my opinion. But maybe a blog. We'll see. I'll post it when I do. Speaking of Charlie. We went and visited Santa on Friday. Charlie was a very good boy. He was smiling and everything. But the picture of his smile wasn't very good. 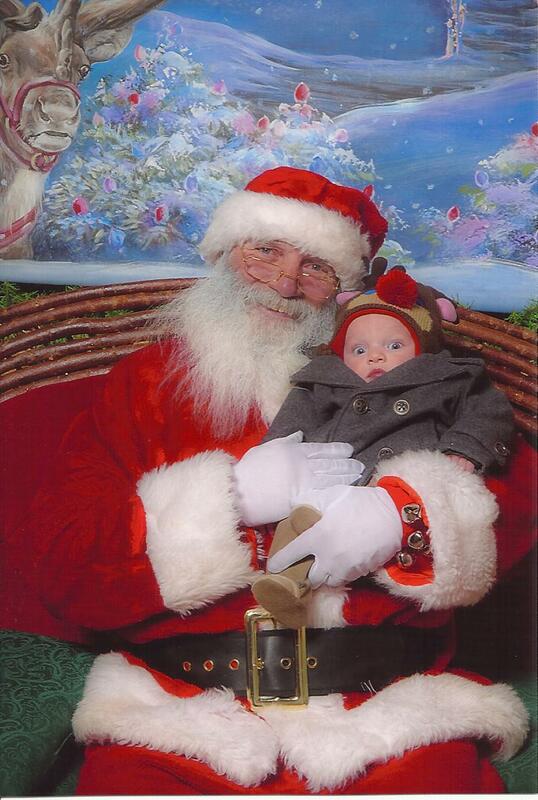 His coat was covering his smile. But we liked this one. Hopefully I'll find out where I'm student teaching this week. I can't wait, but I'm so nervous. Typical Brooke. We'll see if I'm really cut out for this. Anyway, Merry Christmas. Hopefully I'll get one more post in before the year ends! Love ya'll!